Distracted driving caused 6,000 automobile fatalities in 2008 alone. People probably aren’t going to stop texting and fiddling around with gadgets while driving anytime soon, so why not make it a little bit less dangerous to be distracted? That’s one of the things students and researchers at Stanford’s Volkswagen Automotive Innovation Lab (VAIL) are attempting to do with their work on autonomous vehicles–cars that use sensors to drive themselves around without human interaction. 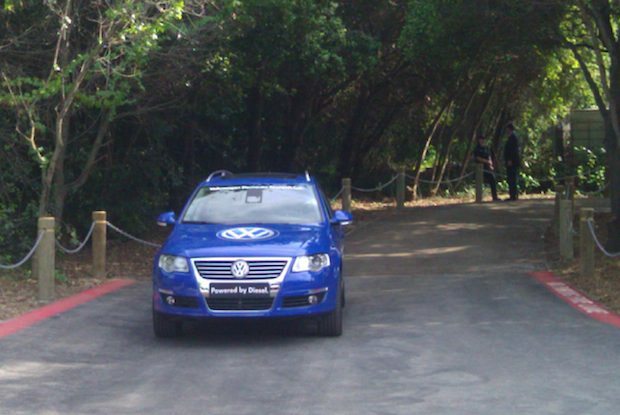 Fast Company recently had the opportunity to take a spin in Junior 3, a robotic Volkswagen Passat that can drive around and park itself without crashing. The valet parking-like system is the third version of a car that took second place in DARPA’s 2007 Urban Challenge, a competition for autonomous cars to navigate city streets, follow traffic laws, and avoid blocks. Junior uses on-board sensors, hardware, and scarily accurate artificial intelligence software to maneuver itself. The whole thing can be started and stopped via an iPhone app. Below, you can take a look at our ride inside Junior 3, as well as a demonstration from the sidelines. Our verdict: riding in Junior is like being driven around by a ghost that makes some seriously hard stops. Still, the vehicle felt safe, and we wouldn’t be surprised to see the technology used in the next few decades to, say, assist drivers in heavy traffic or prevent drunk drivers from spinning off the road.